Figured there should be a thread with all gathered info instead of scattered in update threads. -Party Leader has Velkk fetish (KI, not a fetish for Velkk you sickos). All party members needing is a mistranslation. KI comes from Velkk in Marjami. The higher the Content Level, the higher the number of coffers drop from each mob. I got 8 coffers from boss at CL130. Can warp if you've got to KI, can't warp if party is engaged. NMs assisted by "Adherents", which can use their respective jobs' two-hour abilities. Blue is start, red are NMs I've seen so far. red/grey circle is last reported NM. Green are ports I've taken. 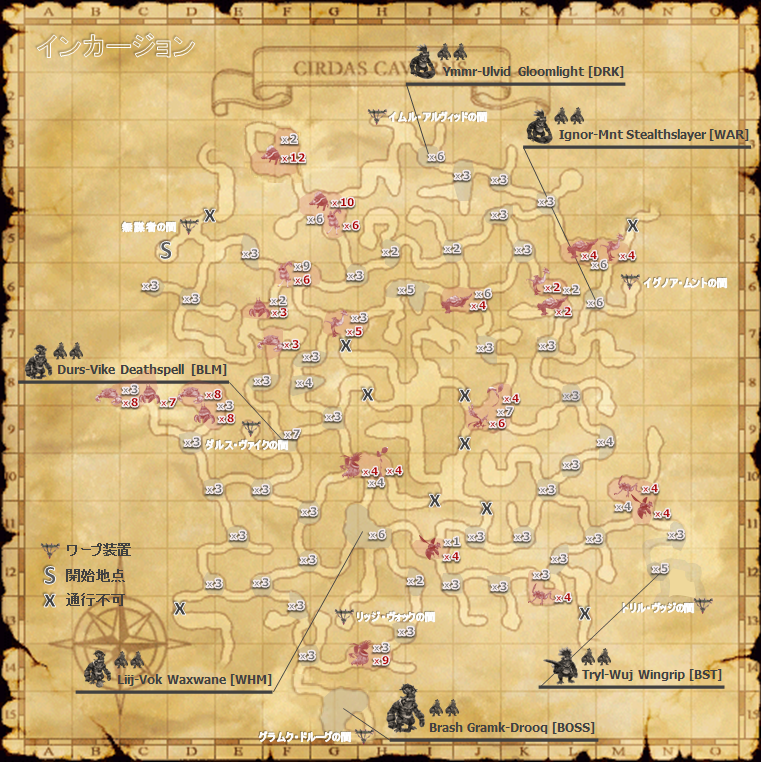 Didn't see this map posted (which is more informative than the one in the OP). Augmented JSE capes are from NM coffers. Higher-level runs seem to give better augments. Here's what I've seen as far as JSE capes/mantles go. Edit: went through the thread to see what other JSE cape / NM matches were posted. got an augmented cape with +28% cap.points, accuracy +3 mnd +1 and def +3 on it from a velkk +1 coffer. The amount of NM HP is big the NMs have, i am not sure if going with a half baked ally will help or hinder you more o.o depending by how much HP will be raised per member. also yagrush adviced, all normal NMs seem to like to spam a move that has a plague curse para effect on it. In 2 runs with 13 people we got ONE cape with +25% CP and nothing else. Came from NQ coffers. ONE single coffer from one of the 3 NMs we killed. Mine was empty. Welcome back Voidwatch chests. How I missed your lovely inventory clogging behaviour! How I missed your good R/E drops on the wrong character attitude! On a side note, Mob's aggro range is 30 yalms, we ended up with around 18k/CP each run, and mobs hit really hard even on "normal" difficulty. I tried with some people from my social, didn't get any NMs killed, but we killed a few rooms of Velkk. Wiped due to accidentally pulling a boss. Velkk seem to aggro to sound. Tried to get up after a wipe and they turned back to kill me. Doesn't seem as far of a range as sight, though. Brash Gramk-Droog could be considered as the "Mega Boss" of Incursion. Although you don't need to kill more than one NM (guarding a teleport) to reach him once you know where is his room. Coming Through : Cone physical attack + Knockback + ? Velkkan Ambush : Single target physical attack (4 hits) + ? Battle Trance : Calls 8 adds (7 Velkks + 1 Puk). This move can be used at any % and is instant. I didn't check if it gives buffs to the boss. Mighty Strikes multiple times. Some of his TP moves can reach 2,5k under MS.
One of his melee hits has AoE Bind effect. Didn't see this thread was made so reposting again here. 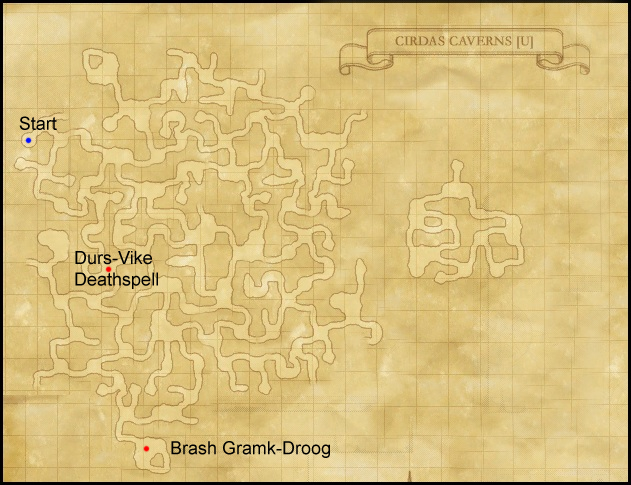 Durs-Vike's coffer: Lifestream cape with Geo. skill +4, Indi. eff. dur. +12, Pet: DT -1% augment. Gramk-Droog's coffer: Pastoralist's mantle with STR +1 DEX +1 and Acc. +3. Gunslinger cape with 5 MAB, -5 enm, -2 Phantom roll and 2% WSD. Grand coffers have a chance to drop the CP cape with 38%+ CP, the NQ only range from in the 20s as far as I've seen. It seems all NM coffers have a chance to drop a JSE cape with augments, but remains to be seen if specific jobs come from specific NMs. Getting all 6 KI and trading them into the NPC causes the content level to go up by only 1(123>124) and you lose all KI and I assume waypoint warps inside too. Hmm aren't job capes rare/ex? Would you have to toss yours before being able to get one in this event? They were now they are just ex. LS mate just got Cap. Points +50% from a grand velkk coffer. I'd guess that's the max until someone proves otherwise. And I just got a 16% from a grand velkk coffer. I was hoping 20% was the minimum from that, but it's not. NQ coffer gave me an 11% mantle. Cornflower cape with 26 mp, 2 dex, 6 acc. Seems decent for JP farming I guess lol. We'll be chasing those capes for a while I suppose, the JSE ones at least. Got capacity +44% cape from NQ box, friends got JSE capes from NM boxes. Cornflower cape with +6 BLU skill, 3 DEX and 20 MP. There's a lot of Velkks with dispelling moves, dunno what's the name of the dispelling TP move but it removes a single buff. Fought 2 bosses: one I can't remember the name but wasn't too dangerous. Somehow evasive and had a dangerous TP move that did a lot of damage AoE (conal?). Onshotted our two sams, in TP gear, weren't at 100% HP but close to that. Think they might have been oneshtoted because they had Def down. The other boss I fought is the one with the big Puk. Puk can be easily slept and as a matter of fact we kept it slept all the fight. This boss was a bit more squishy than the other one and used that "remove weapon" move. He's in the zone that starts with some Chapulis. Throughout the run I used March2, Madri2 and Minux2 (we had Haste2). Feel like Madrix2 was useless for normal targets. I could hit them fine in my normal TP set without food on BRD/WHM. As mentioned before, Vellks aggro at 30 yalms. Well not just them, everything. Link range is much shorter but still considerable. Dunno if they're trueaggro, sound, sight or whatever, but 30 yalms is the range. Some Vellks caster have Blink on them, remember to use AoE sleeps if you wanna sleep them. Ymmr-Ulvid's grand coffer dropped from ilevel 124. Nothing special drop wise except a THF cape with DEX+1 AGI+3 DW+1 and crit. dmg +2%. It stays at ilevel 124. I don't think there's an option to downgrade ilevel once you trade KIs, so keep that in mind. The warps inside are determined by the leader entering. Someone with 0 KI can still use all the NM warps as long as the person who enters has them. "*Content levels that were raised by Grrk-Frut the Charlatan in Marjami Ravine can be lowered by Veldeth in the area’s frontier station (L-7). The content level may not go lower than 123." We only did 2 runs last night and killed 2 NMs each run and did not get any capes. Were you all getting JSE capes at ilvl 123 or was it higher for the JSE capes? Needs more screenshots of capes! Got mekosuschus blade, 90% sure it was from ymmr. 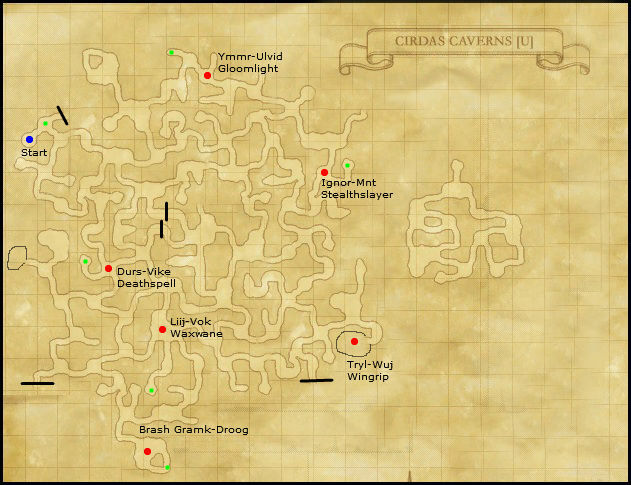 Terrible map I made in 2 min with the 2 NMs I've found so far. I'll keep exploring and marking it up.